The average American has limited knowledge of how the immigration system really works, regardless of their political views. A video series from The Marshall Project, “We Are Witnesses: Becoming an American,” uses personal stories to push back against the binary that puts migrants in two categories: legal and illegal. “No matter how many times I am asked, “Why don’t you just get in line?” I can only respond one way: For most of us, there is no line,” writes undocumented journalist Jose Antonio Vargas in an intro to the series. Despite many people from previous caravans still stuck at the U.S. border, new ones are taking off: Between 800 and 2,000 Honduran migrants left San Pedro Sula on Monday night and Tuesday morning after a flier with an unknown origin circulated on Facebook, and another smaller caravan of about 200 migrants departed from El Salvador on Wednesday morning. “As long as there is poverty, migration is not going to stop,” one migrant told Al Jazeera. A Honduran migrant who traveled with the October 2018 caravan was murdered about a week after being deported from the U.S., reports The Guardian. “Here in this country they just kill. They don’t care about the family’s pain,” said the man’s mother. More than 70 Honduran deportees have been murdered in recent years. As the longest government shutdown in U.S. history continues, a congressional compromise does not seem likely, given the increase in the polarization of the border wall debate in recent years, reports Axios. After Trump spent a lot of time threatening a national emergency to get the wall built it seems he’s pulled back from that idea although the shutdown continues, reports Vox. It’s possible government workers striking or quitting could pressure Trump to reopen the government, explains the Washington Post. More than 43,000 immigration cases have been postponed because of the shutdown and hearings may not be rescheduled until 2022, according to a report by the Transactional Records Access Clearinghouse at Syracuse University. That number could reach 100,000 if the shutdown continues through the end of the month. Trump’s weekend tweet with a slew of statistics suggesting a correlation between crime and undocumented immigration was full of errors and misleading assertions. The New York Times provides a handy fact check. A Trump tweet suggesting the administration would provide a pathway to citizenship for skilled workers with H-1B visas has confused lawyers and experts, who point out that these visa-holders can already apply for residency, reports Forbes. “This tweet runs counter to what the administration has actually done against H-1B workers,” a law professor said. “[Since] April 2017, U.S. Citizenship and Immigration Services (USCIS) has made it harder for employers to hire H-1B workers and to keep them.” Because of these restrictions, more tech workers and tech start-ups have decided to move to Canada, reports the Washington Post. While Trump’s more high-profile immigration policies, such as separating families and restricting access to asylum, have been thwarted by legal action, some less-publicized back-door administrative changes have gone under the radar of organizations such as the ACLU, reports The Guardian. Changing immigration policy through executive power has become more common as Congress has failed to pass comprehensive immigration reform in the past three decades, reports the Washington Post. Immigrants at risk of deportation because of cannabis convictions remain enforcement priorities despite a wave of state legalization, reports Cannabis Wire and DocumentedNY. An Afghan translator who worked with U.S. troops and received a visa to move to the U.S. was detained by CBP in the Houston airport this week, the latest case that shows how airport enforcement has increased under the Trump administration, reports The Houston Chronicle. A wave of sheriffs who campaigned to end cooperation with ICE have contributed to an increase of counties pulling out of the controversial 287(g) program, which allows county sheriffs to help federal authorities deport undocumented immigrants, reports Pew. “We need to build trust with a community that does not trust us. Imagine a robbery victim afraid to call the police or witnesses afraid to come forward. That’s what we were dealing with,” said one recently elected sheriff. Democrats now in charge of the House Homeland Security Committee want to focus on filling 200 vacant Border Patrol postings along the northern border, where the threat of terrorism is more likely, reports Politico. Their focus on on the porous Canadian border is a contrast to the White House’s focus on hiring more agents along the southern border. Thousands of troops sent to the border temporarily in November will now be staying until the end of September after the Pentagon approved a request from DHS to extend the deployment, reports the LA Times. Trump’s proposed border wall evokes different responses in disparate communities along the border. The Guardian, in an in-depth package, visited five sites: In San Ysidro, some residents are shocked by the increasing militarization of the border. In El Paso, most residents are open to new immigrants. In the Rio Grande Valley, a farmer wants the gaps in the border fence closed. A deeper look into the economic relationship between the U.S. and Mexico shows a symbiotic relationship that the U.S. benefits from in many ways, a contrast from the picture Trump has painted. Mexican consumers pump billions of dollars into border towns and many U.S. industries profit from the current trade relationship, reports Rolling Stone. More than 200 migrants turned themselves over to the Border Patrol in a desolate area along the New Mexico border. The El Paso Times reports this usually quiet area is seeing an influx of larger groups arriving there. The Border Patrol union previously opposed building a border wall and called doing so “a waste of taxpayer money,” in a 2012 post on its webpage, reports Politico. “Walls and fences are temporary solutions that focus on the symptom (illegal immigration) rather than the problem (employers who knowingly hire illegal aliens),” it read. The post was deleted this week. Two tunnels believed to be used to smuggle drugs from Mexico were discovered in Nogales, Arizona this month, exposing the limitations of a border wall as a way of preventing drugs from entering the country, reports the Washington Post. The ongoing trial of Mexican drug kingpin El Chapo has brought to light more details of how drugs are smuggled into the U.S. en masse — through tunnels, submarines, and hidden in jalapeno pepper cans driven by trucks through ports of entry — none of which can be stopped by a border wall, reports The Daily Beast. $20 million in donations to a GoFundMe campaign to fund the border wall will be returned to donors given that the campaign did not reach its $1 billion goal, reports the Washington Post. The GoFundMe campaign to build the border wall appears to be part of a larger email harvesting campaign by its founder, who now has the emails of 3.5 million people willing to donate to conservative causes, reports NBC News. A federal judge ruled that the Trump administration cannot put a citizenship question on the 2020 census, based on the failure of Commerce Secretary Wilbur Ross to follow the standard procedure to make the change. The New York Times reports the case “seems certain to reach the Supreme Court before the printing of census forms begins this summer.” The census will be used to determine redistricting in 2021 and the change could have shifted the political tides in Republican’s favor. Thousands of visas for child brides have been approved in the U.S. in the last 10 years, leading to questions about whether U.S. immigration policy encourages child marriage even though it restricts other bringing other family members such as parents, reports AP. The Trump administration plans to double the capacity of a detention center in Florida for migrant teens, reports the New York Times. The facility will be “temporary,” as was the recently closed tent city in Tornillo, meaning it will be subject to less regulations and oversight. Language barriers persist for immigrants who speak indigenous languages and are taken into CBP and ICE custody, despite knowledge of the problem since as early as 2000, reports Arizona Daily Star. Overstaying a visa continues to be the most common form of illegal immigration, rather than crossing the border, according to new statistics from the Center for Migration Studies. The undocumented Mexican population has decreased since 2016, while the undocumented population from Venezuela, India, and Central America’s Northern Triangle has increased. The American labor market has been addicted to undocumented immigrants for a century. “The roots of our addiction can be traced to the early 1920s, when Americans began to rely on immigrants from Mexico to replace the European and Asian immigrants who had been barred from entry into the United States by new quota laws,” historian Julia G. Young writes in an opinion piece for the Washington Post. “During the Depression, however, the need for immigrant labor diminished, and Mexicans were rounded up and deported en masse during the repatriation drives of 1929–1936.” Kicking the habit today would mean increased prices for food, construction, hotels and other services, a cost many consumers don’t want to absorb. The American myth of “mass migration,” based on an arbitrary percentage decided in the early 20th century, has prevailed in recent years, but the country should actually admit one million more immigrants per year until 2050 to maintain a healthy economy, writes Shikha Dalmia, a senior analyst at Reason in an Opinion piece for the New York Times. 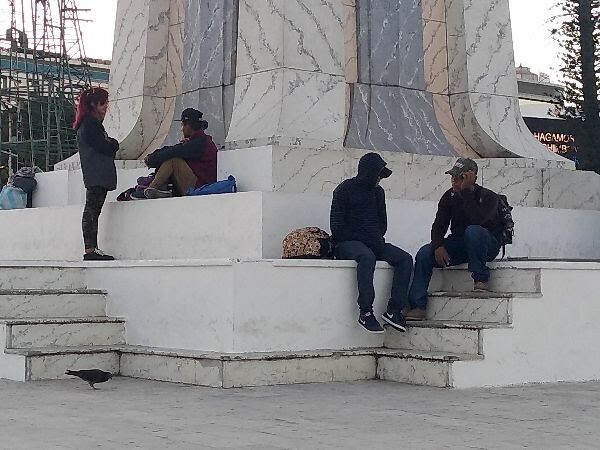 A Haitian migrant who traveled by land from Brazil to Mexico to reach the U.S. has decided to forego the “American dream” to make a life in Tijuana, he writes in an opinion piece for the LA Times. He frequently visits shelters to present Mexico as a viable option for Central American migrants to start over, “rather than putting everything on hold in pursuit of a goal that may be unattainable,” given the difficulties of entering the U.S.
Humanitarianism and Mass Migration Confronting the World Crisis, by Marcelo Suarez-Orozco, reveals how in this young century more than 65 million people have already been forced to leave their homes. Vanishing Frontiers: the Forces Driving Mexico and the United States Together, by Andrew Selee, explores the two countries intertwined histories. The Making of a Dream: How a group of young undocumented immigrants helped change what it means to be American, by Laura Wides-Muñoz, covers the growth of the Dreamer movement. Displaced, a podcast from the International Rescue Committee. The Pew Research Center offers a mini email course on immigration to the U.S.